← Personal is Heretical: Theater J’s Andy and the Shadows, reviewed. This photo is from August 15, 2004. My race-partner Steph — HI, STEPH! — and I are competing in the Muddy Buddy running/biking relay race in San Dimas, CA, home of Bill & Ted. I dug it up because at this time tomorrow I’ll be — I hope — more than halfway through the Tough Mudder, a 10-12 mile military-style obstacle course designed to be a physical and mental trial for all comers, no matter how fit and/or nuts they are. 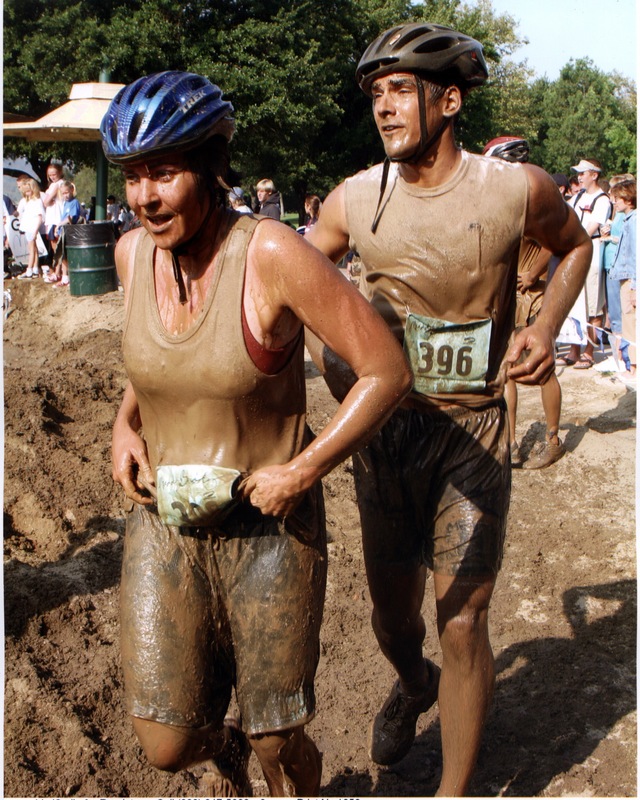 The Muddy Buddy is not all that similar: It’s only half as long as the Tough Mudder, and you’re not made to swim in icy water (they refresh the ice frequently to prevent the water from reaching a comfortable temperature) or run through a lattice of 10,000-volt live wires. (I’m not exaggerating. You can read about the Tough Mudder obstacles here.) But of the races I’ve done, mostly 10ks and 10-milers and half-marathons, it’s the one that most resembles the Mudder. I’m starting to get nervous. But I take comfort in this: The Tough Mudder is a team race. Some people have a target completion time in mind, but even that is hard to plan for because each course is different. The obstacles are designed to be impossible for an individual to pass alone; you literally — no, literally — have to let people stand on your shoulders and/or pull them up by their arms. The goal is to get your entire team to the finish line before anyone succumbs to injury or exhaustion. The goal is don’t give up. My team of four has been training together for about two months. We were five until our leader’s appendix exploded two weeks ago. In what was probably a surfeit of Mudder toughness, he waited until three days after his appendix ruptured to seek care, elevating an already dangerous condition to life-threatening. He was in the hospital for nine days, but he’s home now. We’ll be running for him. Tomorrow’s predicted high temperature in Gerrardstown, West Virgina, where this thing is going down, is 59 degrees Fahrenheit. That’s a comfy running-race temperature for me. Perfect, actually. I live in in the humid city of Washington, DC. Torrential would fairly describe my sweat volume when I work out. J’effuse more than anybody I’ve ever met, and I have a lot of athletic friends. I seal my iPod in a ziplock bag when I’m running or skipping rope or shadowboxing or hitting the heavy bag. More than one iPod has met a salty-watery end attached to my person. I don’t like to wear a shirt when I run if it’s warmer than about 60, and once it hits maybe 75, I can’t wear one, or I’ll come home with a painful, perfectly shirt-shaped rash. So 59 is Kool and the Gang. Fifty-nine is mercy. BUT WE’VE BEEN WARNED! that we’ll be head-to-toe soaked tomorrow after the first mile of the race. At least two of the 20-25 obstacles we’ll encounter require immersion in water just a few degrees north of freezing. Many of the others — greased-up monkey bars, greased-up gymnast’s rings, a wobbly, narrow balance beam — punish you with a fall into cold water if you lose your balance or your grip. Lots of Mudder veterans say the fatigue induced by prolonged exposure to the cold is what makes the race so difficult. I’m still trying to decide what to wear. Meaning, I’m trying to decide if I should wear something else underneath this snug-fitting thing. Don’t mock me. Or do, I don’t care. Sticks and stones may break my bones, but I’m still more worried about hypothermia. Funky costumes are, I’m told, a Tough Mudder tradition. Competitors are encouraged to wear something that’ll make them recognizable to their teammates once everybody is mud-suited like Arnold Schwarzenegger at the end of Predator. And I need the inspiration. Especially after those bastards detonated bombs at the Boston Marathon earlier this week, killing people and severing the legs of folks who, like me, find joy and nourishment in running. Which somehow makes the attack feel even more malevolent and cruel, as if that were possible. 2. He never gives up. It might be a little, I don’t know, ostentatious to wear this in an individual athletic event. Like, I would worry about someone kneecapping me. I saw a YouTube video of a guy running the Tough Mudder in a full Captain America costume. But the Tough Mudder is a communal event. I’m not looking forward to trying to swim in my taped-to-my-legs running shoes or shivering in the wind. But I’m pretty excited about helping people — and being helped — over those walls. 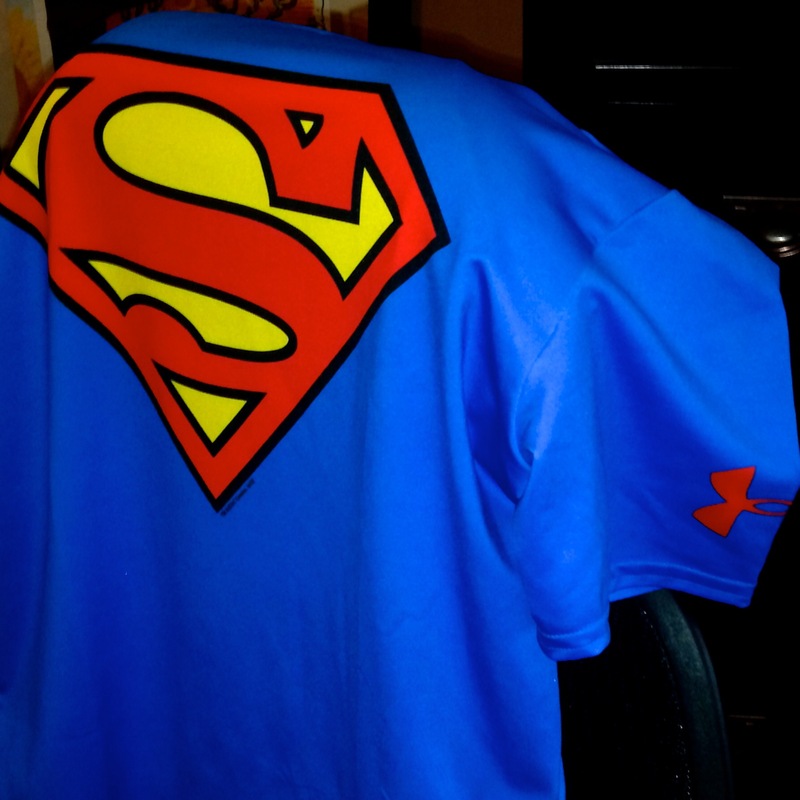 This entry was posted in Uncategorized and tagged Glen Weldon, navel-gazing, Superman, sweat, Tough Mudder. Bookmark the permalink.